Great location, great food, , awesome pool, friendly staff, lots of shops and restaurants nearby. The location is excellent for all age categories. Staff are friendly and helpful. Amazing staff, 24h reception, great location and beautiful view from the balcony. Markets at the property, beach across the road, great restaurants and clubs close by. *Great location - right at the beach, restaurants, clubs etc. ; *Heated pool and jacuzzis; *Soft paddings for sunbeds and free swim-rings; *Well equipped kitchen; *Amazing view from the balcony (we lived on 8th floor); *Cleaning every day; *Great and helpful staff; *Baby crib that was provided; *Asked for a room in quiet area and got it - street, pool or party noises couldn't be heard in our room. Located right next to the beach. Plenty of food and shopping options. There was nothing that I can honestly say I liked about the hotel, hot tubs was ice cold and dirty, rooms was dirty and nothing like the photos - the hotel is run down - its just nothing what I expected. disgusting. 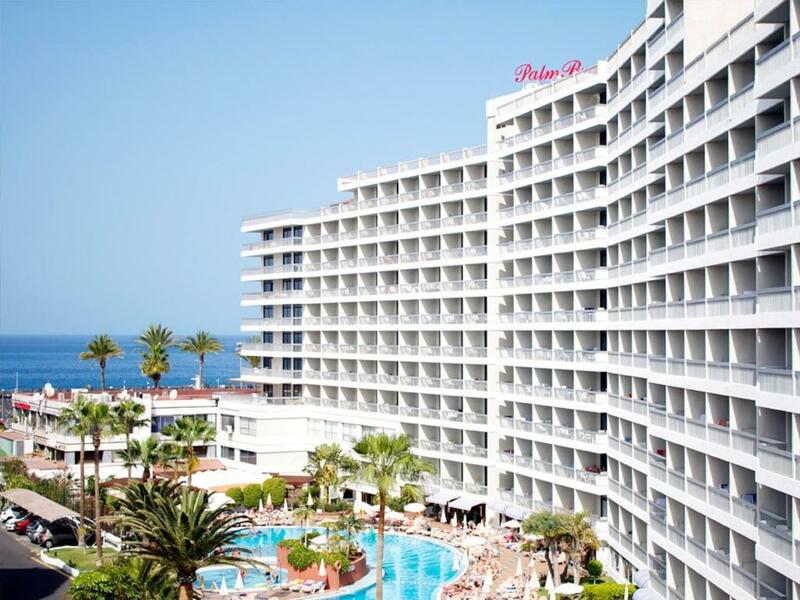 The hotel is in the best location in Playa de Las Americas. It has a great pool with a good animation team. It's also literally 50 meters away an awesome beach. Location; meals, restaurant team is nice and is not bothering you with extras; view from CORRIDOR (open) is the best; stuff helpful in general (though we had issues with cleaning, but more or less it was resolved), wifi more or less ok despite what other revewers said. 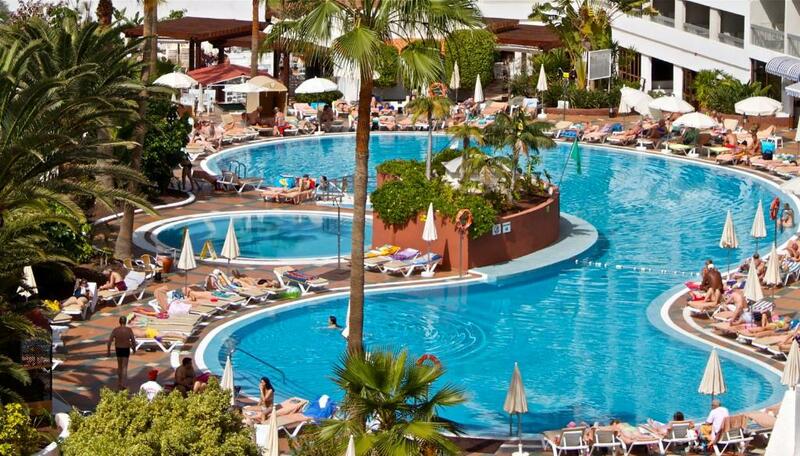 One of our top picks in Playa de las Americas.Offering stunning views of the Canary Islands, this attractive apartment complex is set just 30 feet from Troya Beach. It features an adult and children’s outdoor pool, a gym, hot tub and sauna. Apartments and studios at Palm Beach Club feature elegant décor and pool or sea views. Lounges have a sofa bed and plasma TV with DVD player and modern kitchens include microwave, fridge and toaster. DVDs and a safe can be rented at reception. The complex has a cafeteria, bar and a selection of restaurants, as well as on-site supermarket and beauty salon. It is within 5 minutes’ walk of numerous shopping centers, bars and restaurants. You can rent a car, exchange currency and book excursions at Palm Beach’s 24-hour reception. 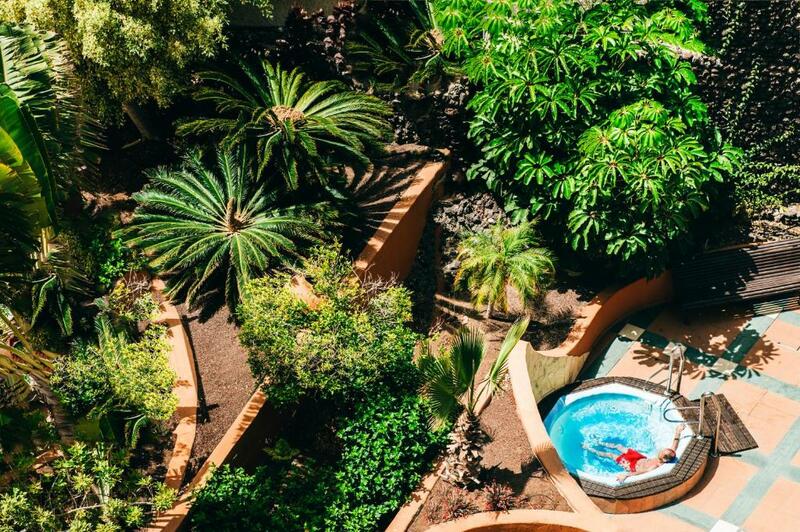 Las Americas Golf Resort is 10 minutes’ walk away and Tenerife South Airport is 15 minutes’ drive away. When would you like to stay at Palm Beach Tenerife? This air-conditioned studio features elegant décor and pool or sea views. The lounge area has a sofa bed and plasma TV with DVD player, while the modern kitchenette includes microwave, fridge and toaster. DVDs and a safe can be rented at the front desk. This air-conditioned apartment features elegant décor and pool or sea views. The lounge has a sofa bed and plasma TV with DVD player, and the modern kitchen includes microwave oven, fridge and toaster. DVDs and a safe can be rented at the front desk. 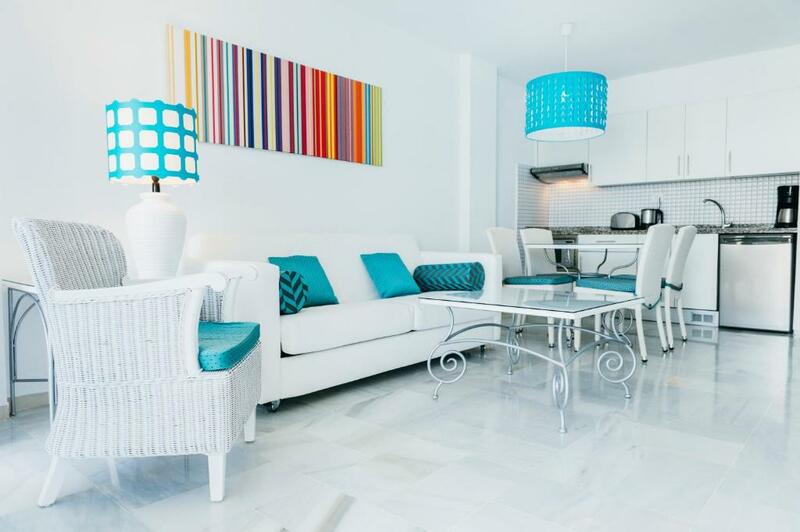 This air-conditioned apartment features elegant décor and pool or sea views. The lounge has a sofa bed and plasma TV with DVD player, and the modern kitchen includes microwave oven, fridge and toaster. There is one double and one twin bedroom and DVDs and a safe can be rented at the front desk. This air-conditioned apartment features elegant décor and pool or sea views. The lounge has a sofa bed and plasma TV with DVD player, and the modern kitchen includes microwave oven, fridge and toaster. There is one double and one twin bedroom, and DVDs and a safe can be rented at the front desk. This studio features a microwave, stovetop and electric kettle. A safe can be rented at reception. The bathroom comes with bath or shower and hairdryer. Featuring a balcony, this studio has air conditioning and a flat-screen TV. A safe can be rented at reception. The bathroom comes with bath or shower and hairdryer. This apartment features air conditioning, a kitchen fitted with an electric kettle and a sofa. A safe can be rented at reception. The bathroom comes with bath or shower and hairdryer. This apartment has air conditioning, a kitchen fitted with an electric kettle, DVD player and sofa. A safe can be rented at reception. The bathroom comes with bath or shower and hairdryer. Featuring a balcony, this apartment has air conditioning, kitchen and a sofa. A safe can be rented at reception. The bathroom comes with bath or shower and hairdryer. Featuring a balcony, this apartment has air conditioning, a dining area, kitchen and sofa. A safe can be rented at reception. The bathroom comes with bath or shower and hairdryer. Featuring a balcony, this apartment has air conditioning, a sofa, dining area and kitchen. A safe can be rented at reception. The bathroom comes with bath or shower and hairdryer. Featuring a balcony, this apartment has air conditioning, kitchen and seating area with a sofa. A safe can be rented at reception. The bathroom comes with bath or shower and hairdryer. This apartment features a tile/marble floor, air conditioning and seating area. Rooms are 52 square yards. House Rules Palm Beach Tenerife takes special requests – add in the next step! A EUR100 damage deposit is required on arrival (around USD111.44). This deposit will be fully refunded at check-out, as long as there isn't any damage to the property. 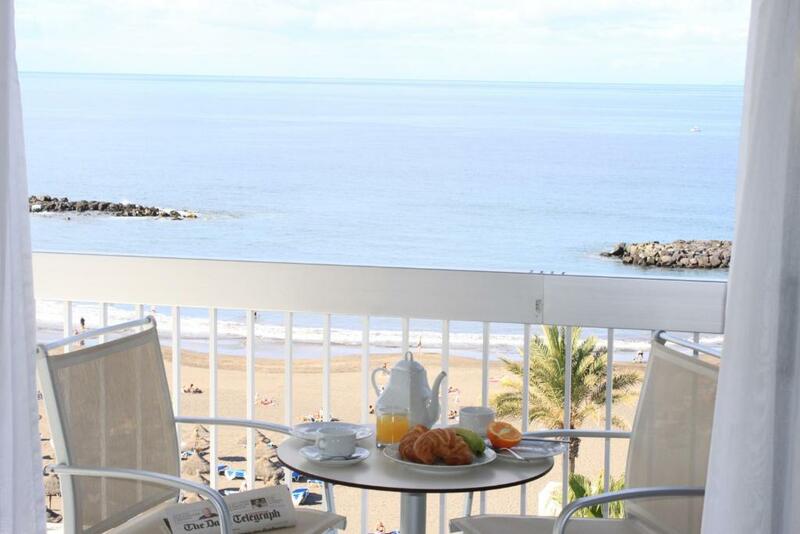 Palm Beach Tenerife accepts these cards and reserves the right to temporarily hold an amount prior to arrival. 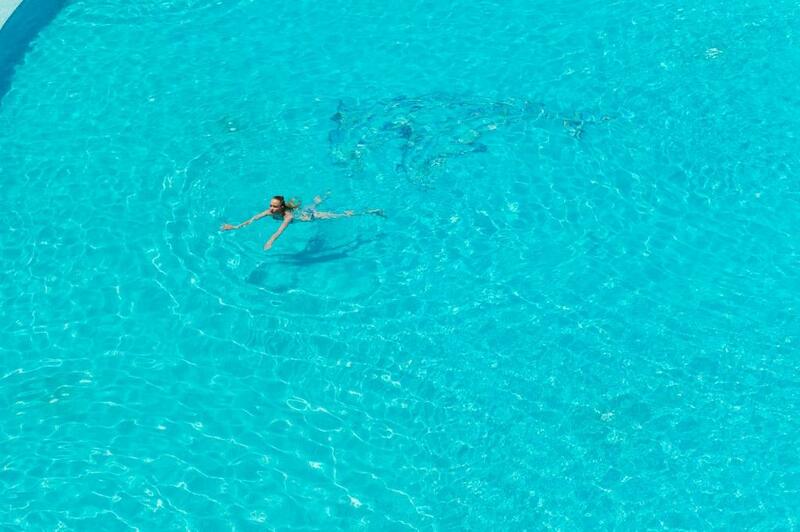 Pool towels are available for a fee of EUR 5 per week. Please note that they can be changed daily. A damage deposit of EUR 100 is required on arrival. That's about 111.44USD. This will be collected by credit card. You should be reimbursed on check-out. Your deposit will be refunded in full by credit card, subject to an inspection of the property.